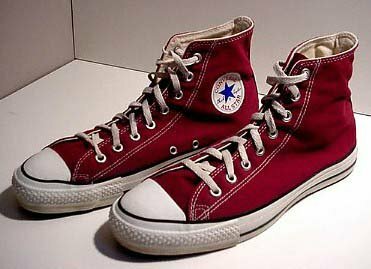 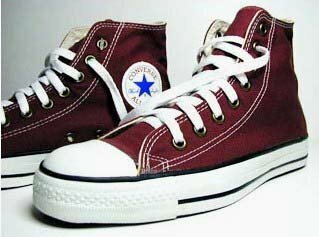 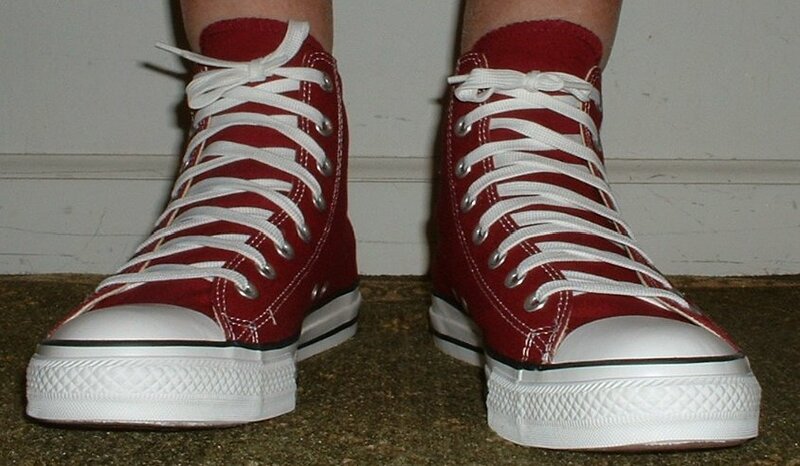 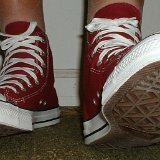 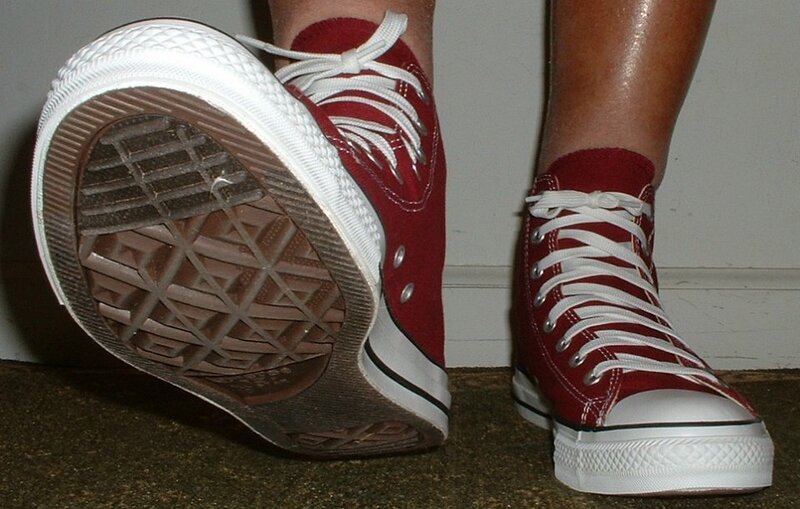 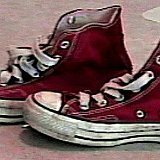 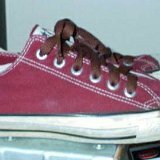 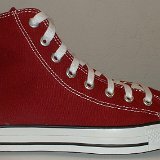 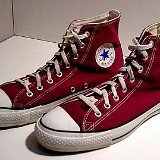 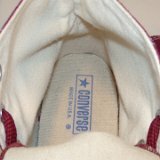 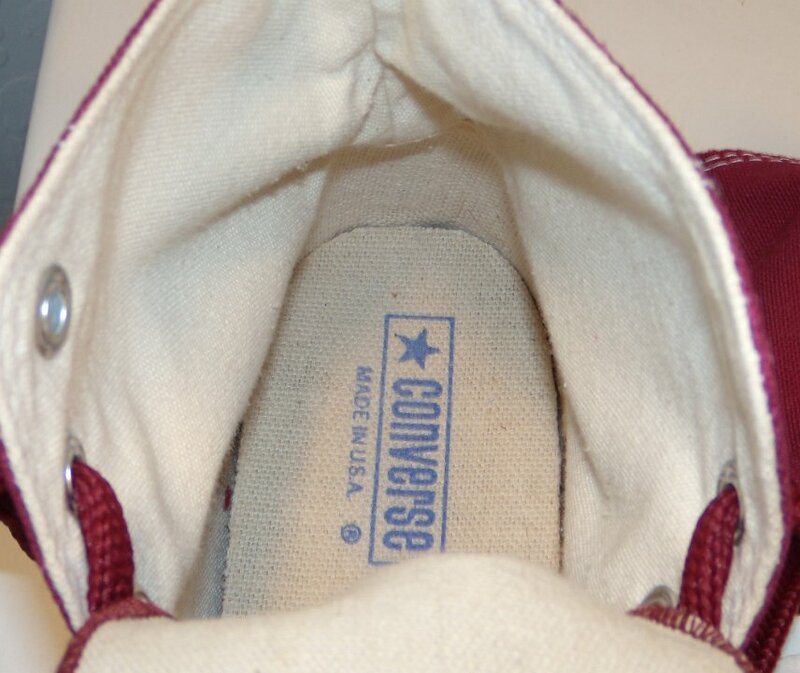 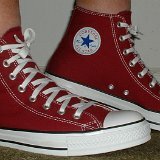 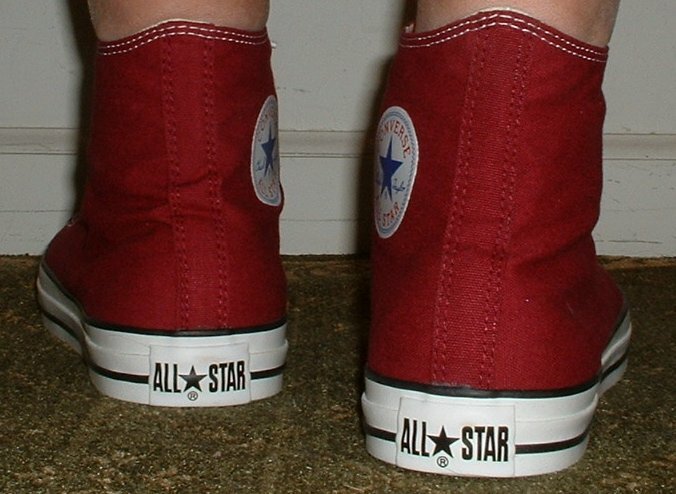 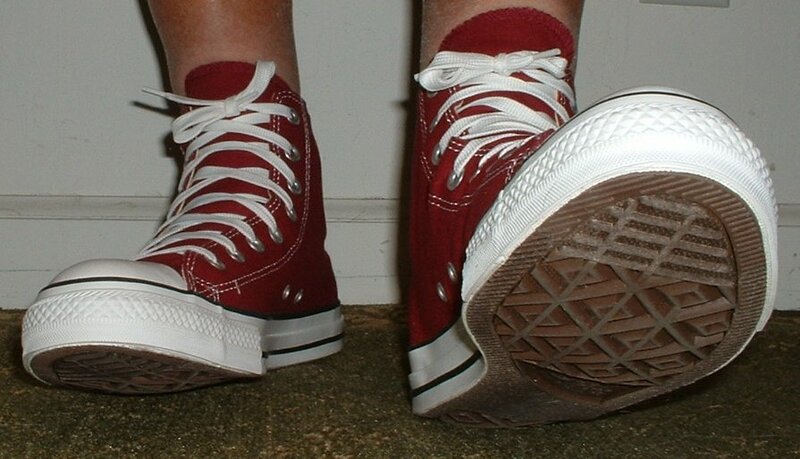 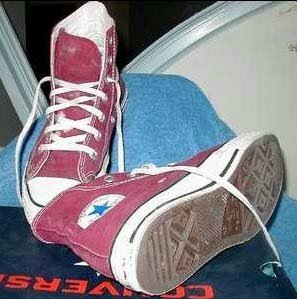 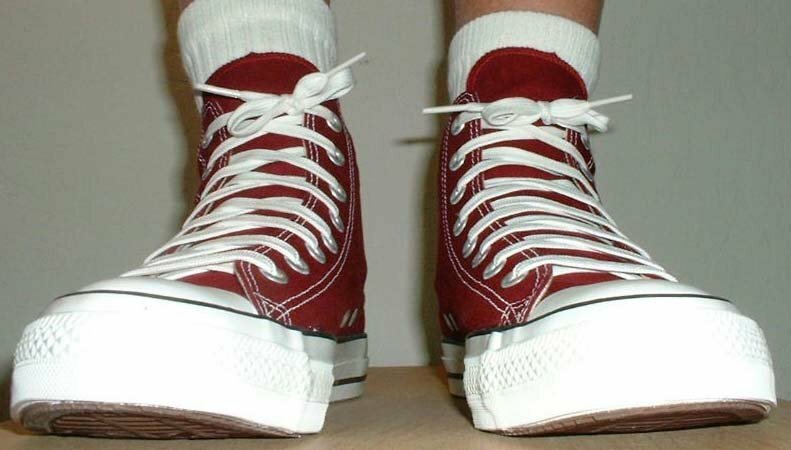 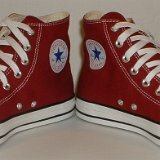 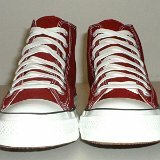 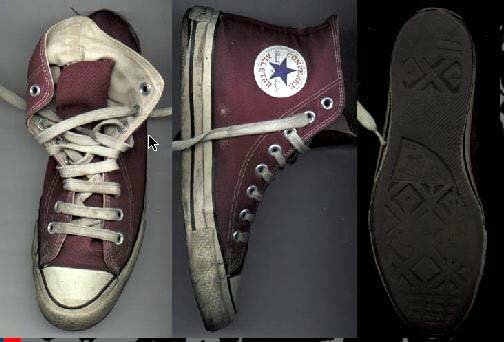 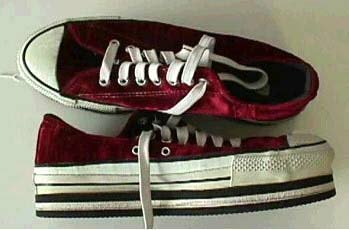 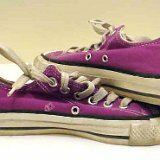 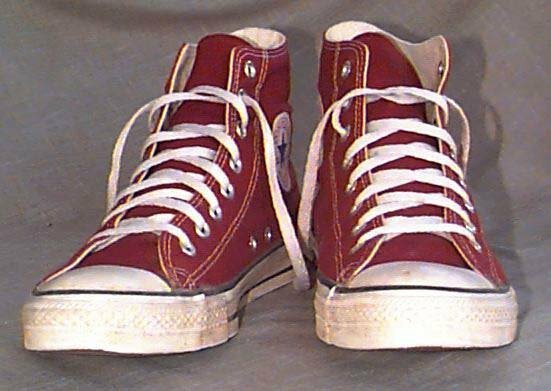 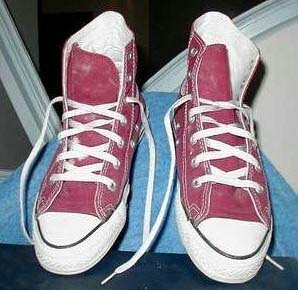 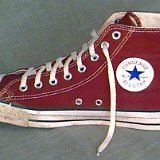 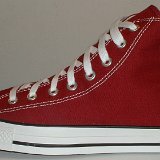 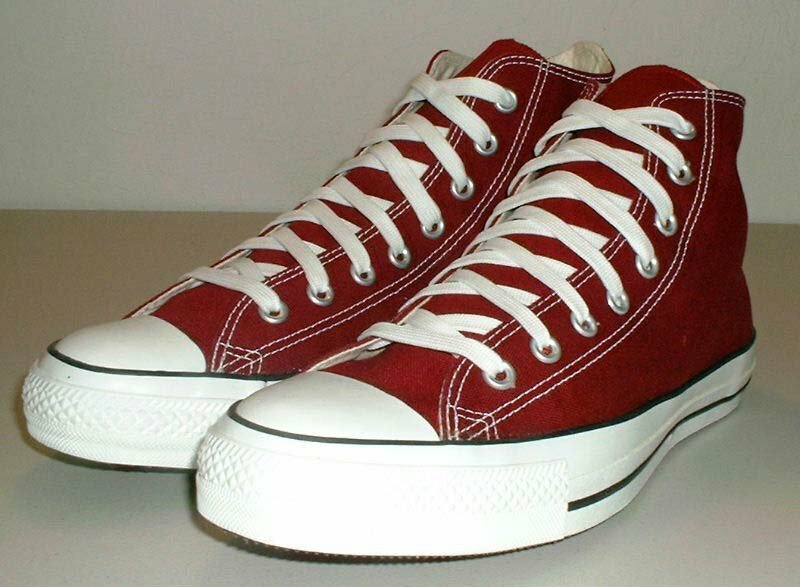 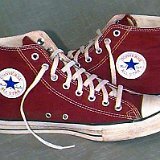 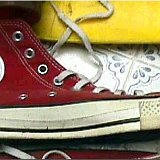 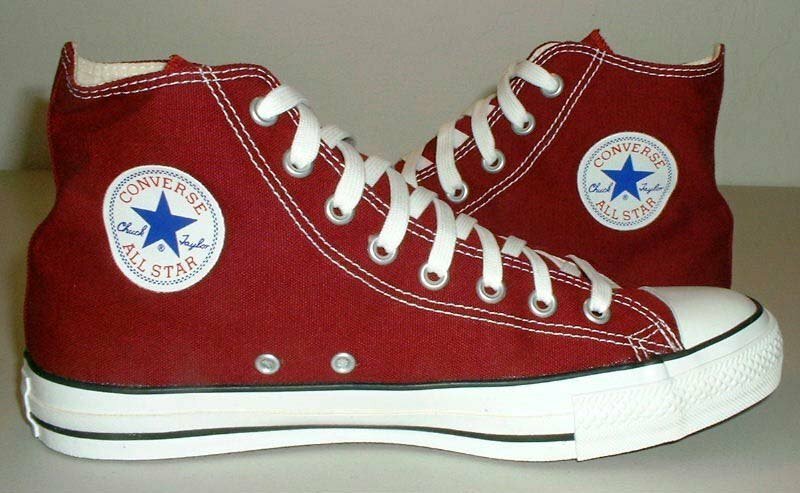 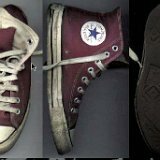 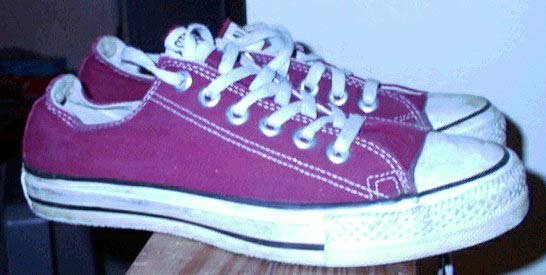 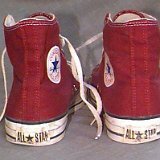 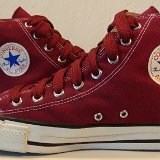 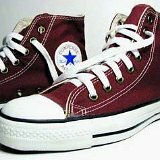 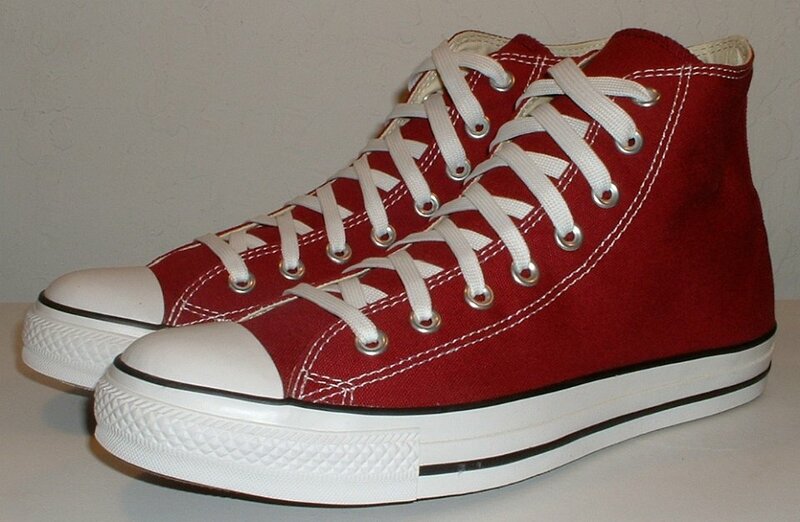 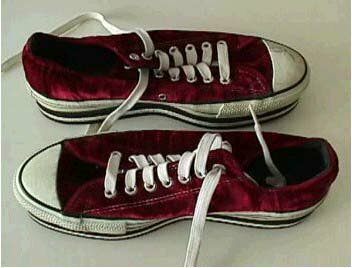 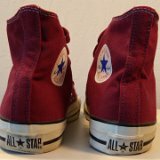 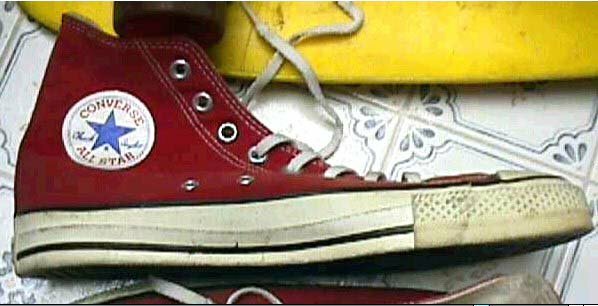 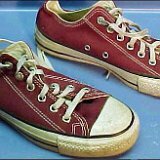 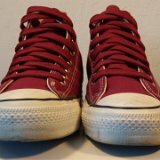 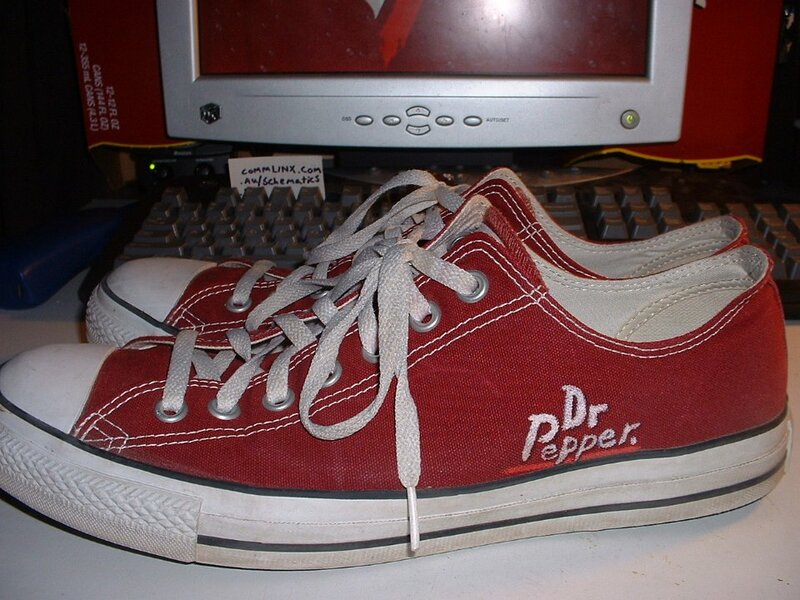 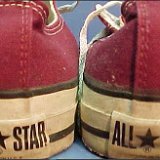 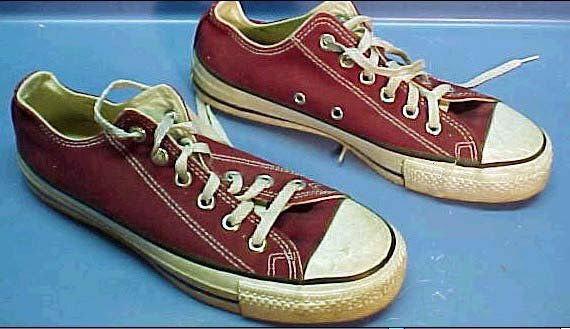 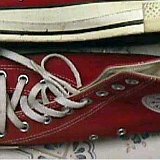 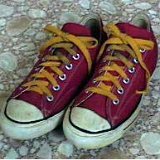 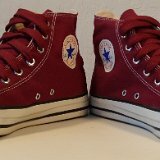 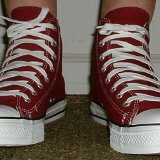 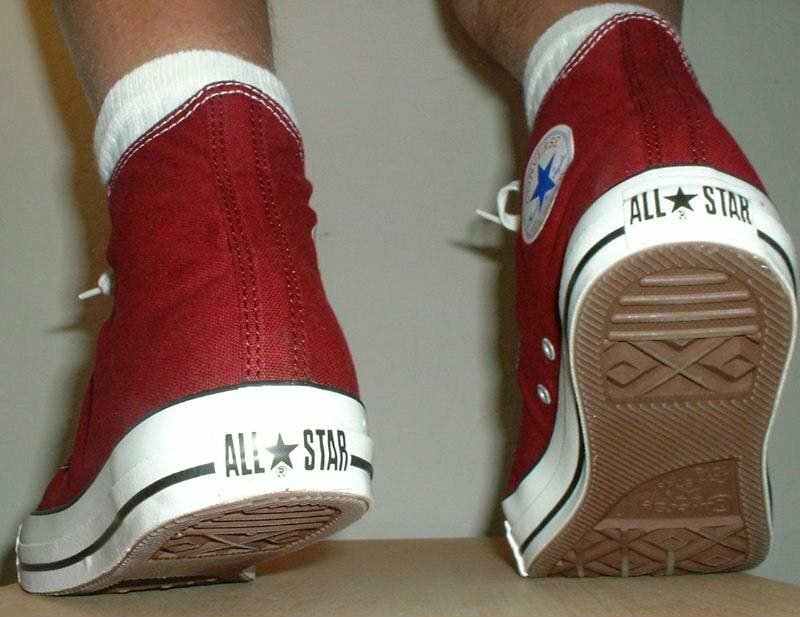 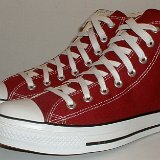 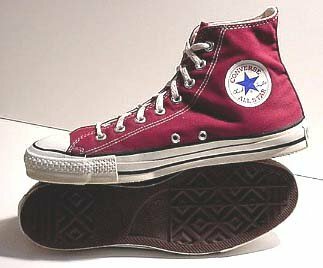 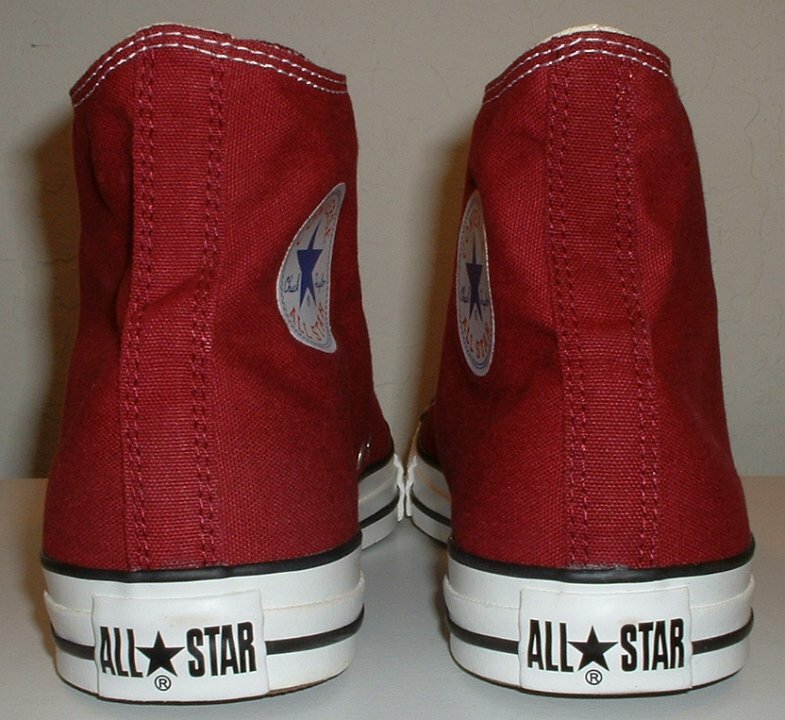 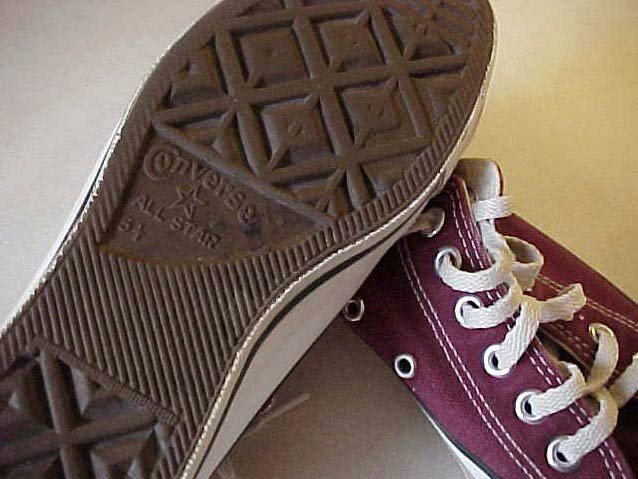 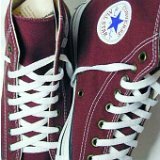 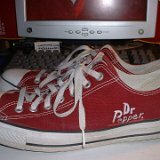 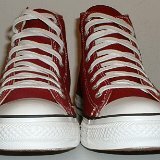 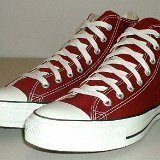 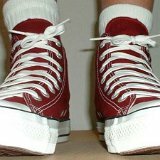 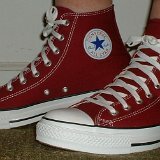 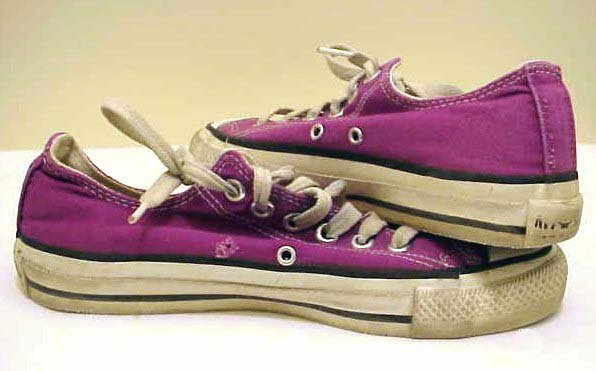 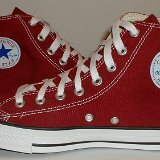 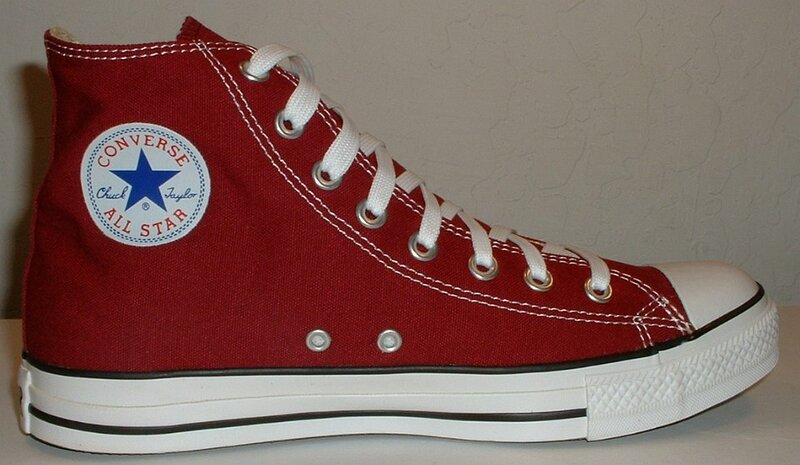 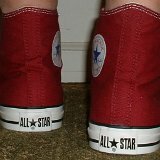 Photo gallery of maroon high top and low cut chucks from the past twenty years. 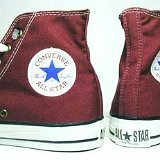 1 Maroon High Top Chucks Left maroon high top, inside patch view. 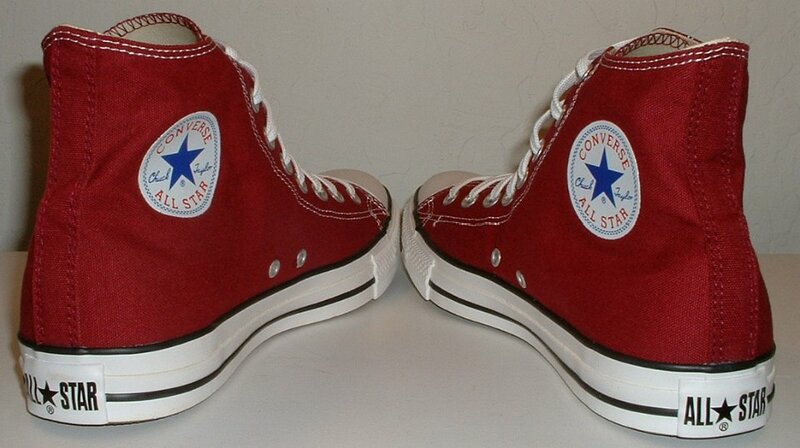 2 Maroon High Top Chucks New maroon high tops with tag, angled front view. 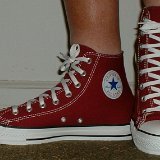 3 Maroon High Top Chucks Wearing maroon high tops, inside patch and front views. 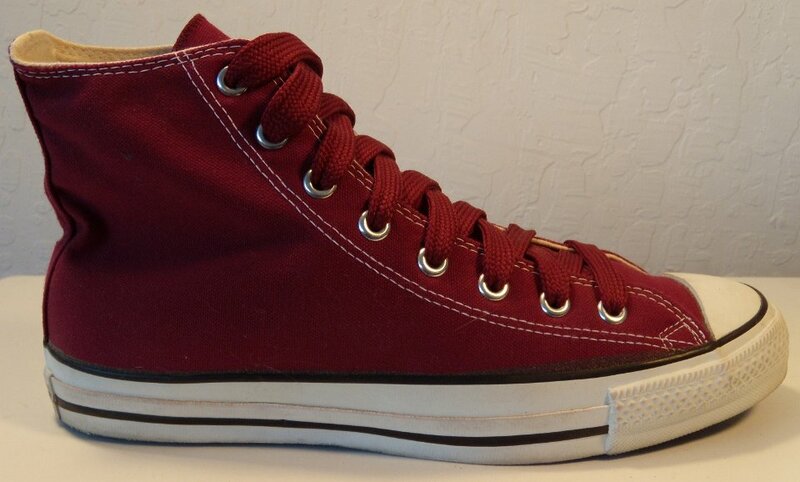 4 Maroon High Top Chucks New maroon high tops, angled side views. 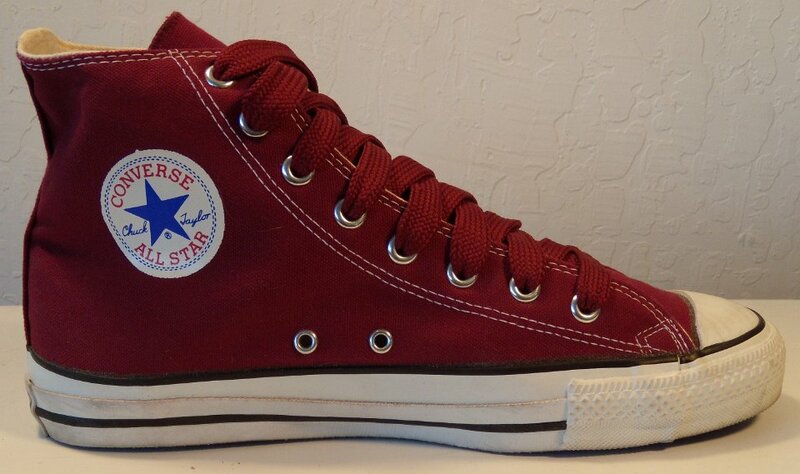 5 Maroon High Top Chucks New maroon high tops, close up of inside patches and rear heel patch. 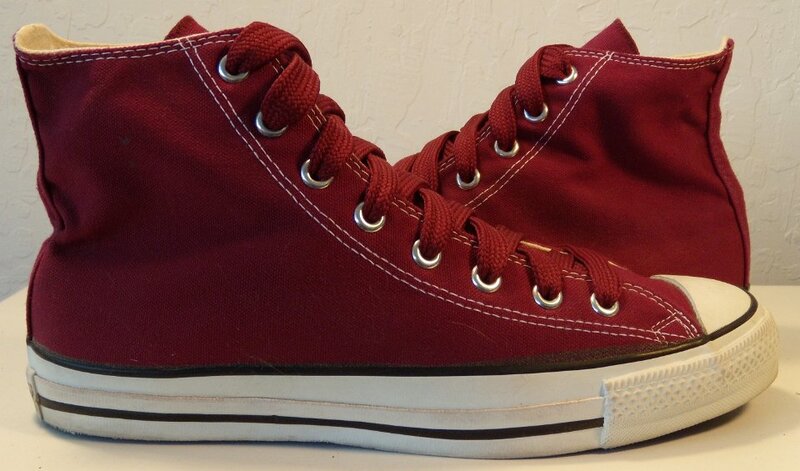 6 Maroon High Top Chucks New maroon high tops, top and angled top views. 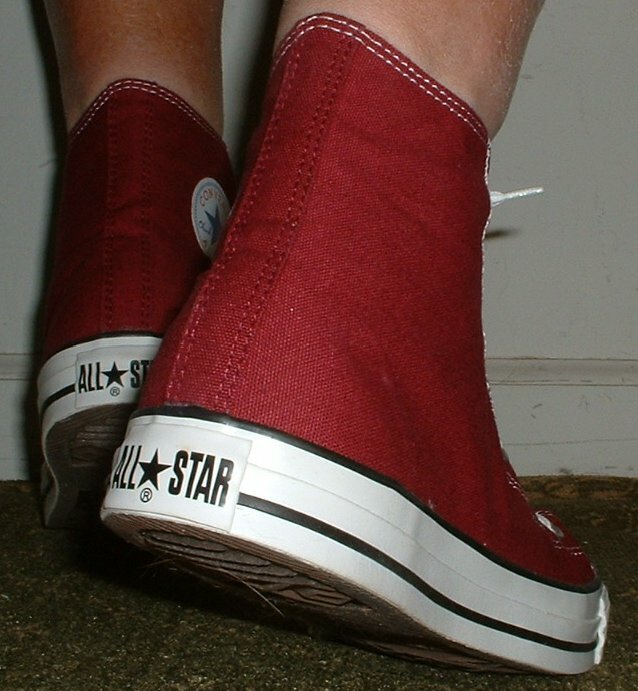 7 Maroon High Top Chucks Maroon high tops, angled side views. 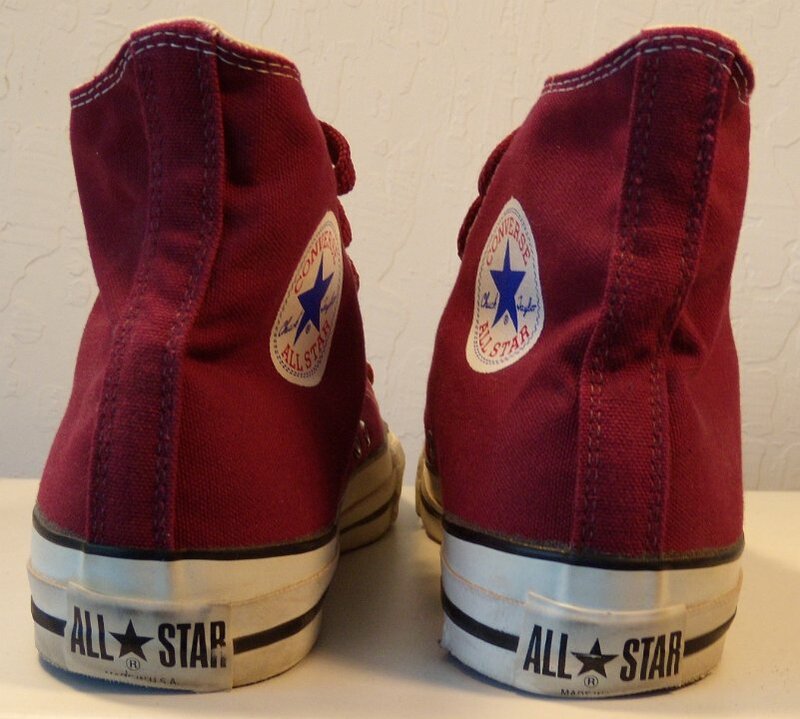 8 Maroon High Top Chucks Worn left maroon high top, inside patch view. 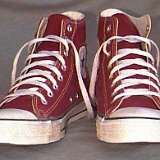 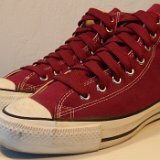 9 Maroon High Top Chucks Worn maroon high tops, top and partial side views. 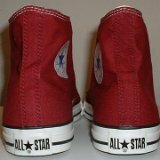 10 Maroon High Top Chucks Maroon high tops, inside patch and sole views. 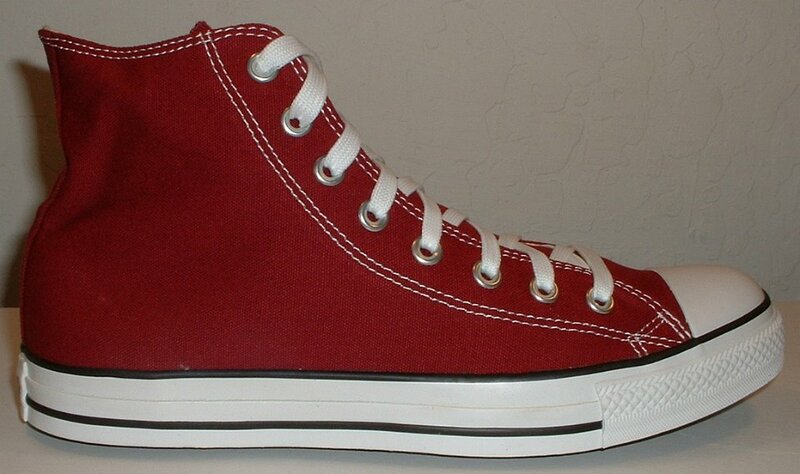 11 Maroon High Top Chucks New maroon high tops, angled outside view. 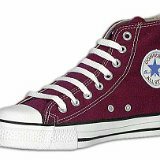 12 Maroon High Top Chucks Maroon high tops, front and rear views. 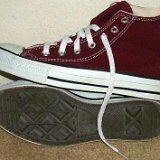 13 Maroon High Top Chucks Worn maroon high tops, side view. 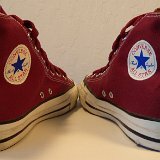 14 Maroon High Top Chucks Maroon high tops, outside and sole views. 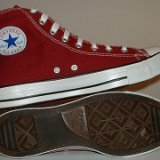 15 Maroon High Top Chucks New maroon high tops, top and sole views. 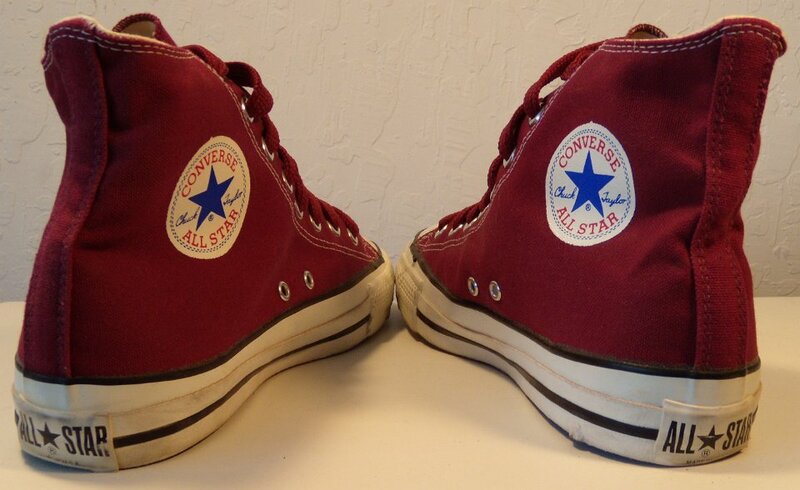 16 Maroon High Top Chucks Worn maroon high tops, side to side view. 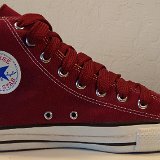 17 Maroon High Top Chucks Wearing maroon high tops, inside patch and front views. 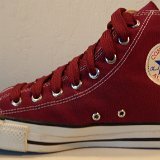 18 Maroon High Top Chucks Worn maroon high tops, inside patch and sole views. 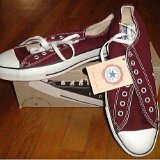 19 Maroon High Top Chucks New vintage maroon high tops, with tag and box. 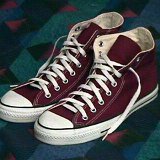 20 Maroon High Top Chucks Worn maroon high tops, front view. 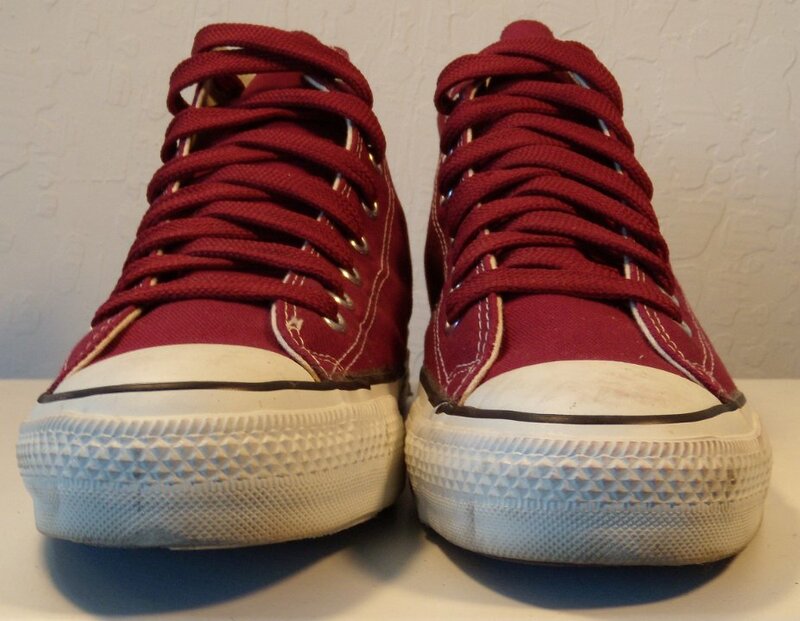 21 Maroon High Top Chucks Well worn left maroon high top, top, inside patch, and sole views. 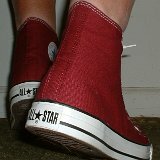 22 Maroon High Top Chucks Worn maroon high tops, rear view. 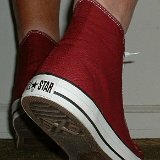 23 Maroon High Top Chucks Worn maroon high tops, inside patch views. 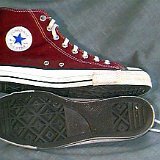 24 Maroon High Top Chucks Worn maroon high tops, angled side view. 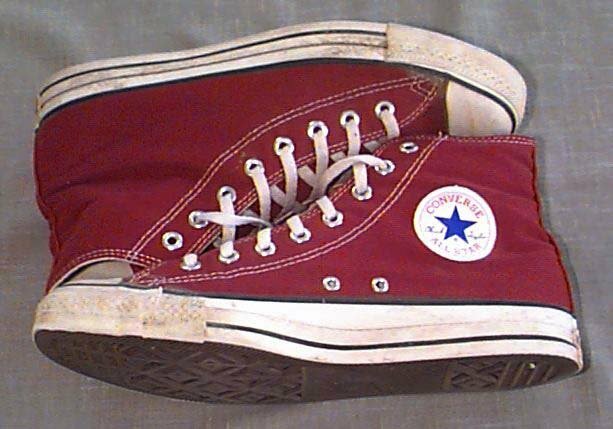 25 Maroon High Top Chucks Worn left maroon high top, inside patch view. 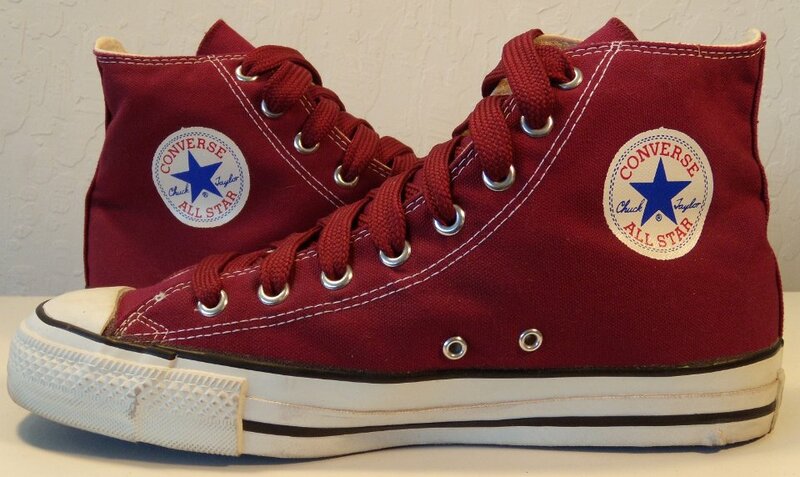 26 Maroon High Top Chucks Worn right maroon high top, inside patch view. 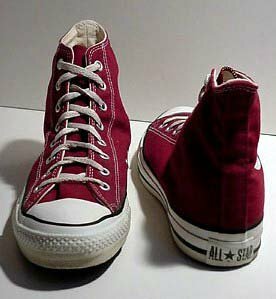 27 Maroon High Top Chucks Maroon high tops, top view. 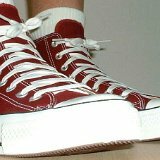 28 Maroon High Top Chucks Maroon high tops, top and angled sole view. 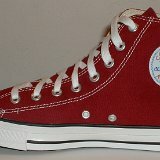 29 Maroon High Top Chucks Right maroon high top, angled inside patch view. 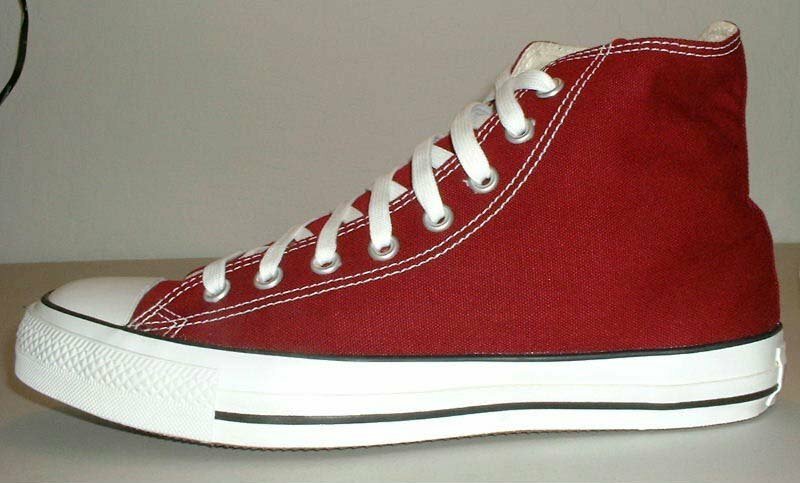 30 Maroon High Top Chucks New maroon high tops, front view. 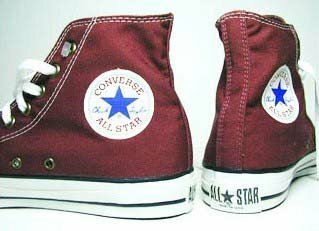 31 Maroon High Top Chucks New left maroon high top, inside patch view. 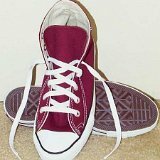 32 Maroon High Top Chucks New left maroon high top, outside view. 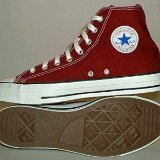 33 Maroon High Top Chucks New right maroon high top, inside patch view. 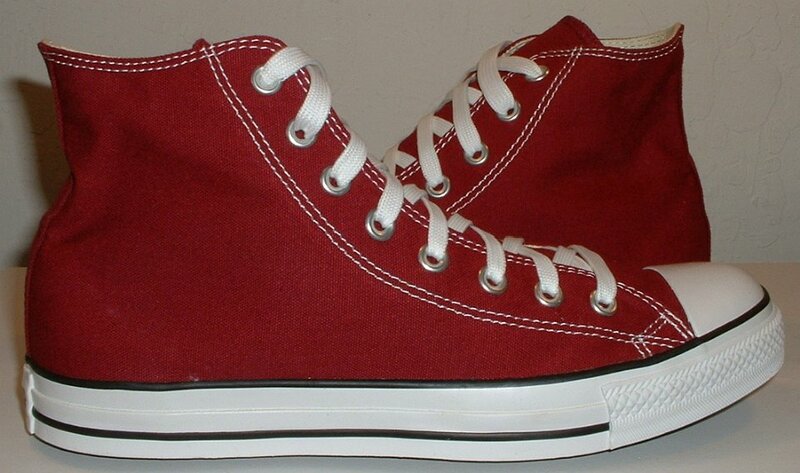 34 Maroon High Top Chucks New right maroon high top, outside view. 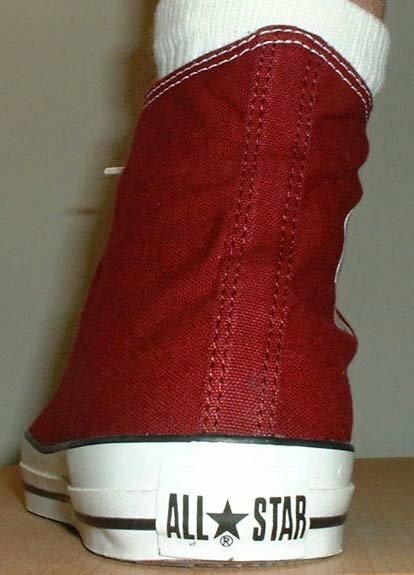 35 Maroon High Top Chucks New maroon high tops, rear view. 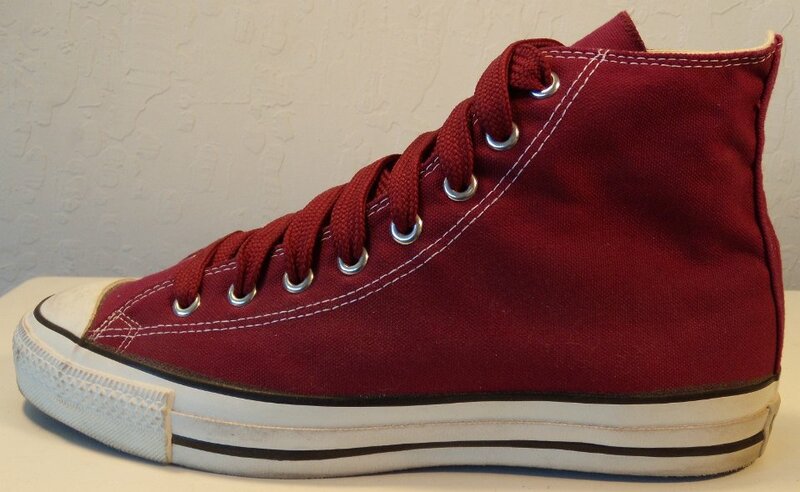 36 Maroon High Top Chucks New maroon high tops, inside patch and sole views. 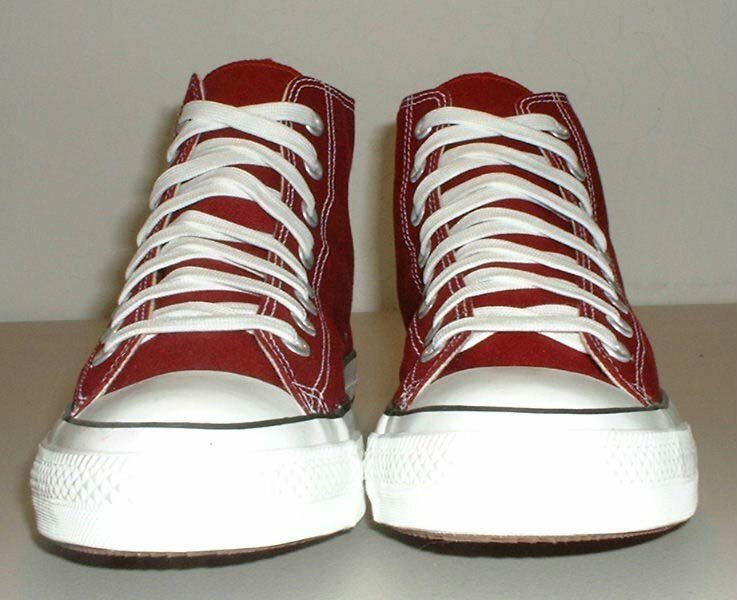 37 Maroon High Top Chucks New maroon high tops, angled outside view. 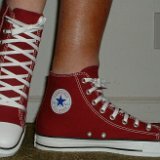 38 Maroon High Top Chucks New maroon high tops, inside patch views. 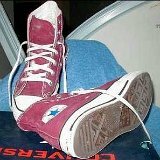 39 Maroon High Top Chucks New maroon high tops, top view. 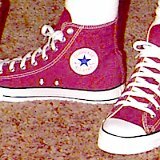 40 Maroon High Top Chucks Stepping out in maroon high tops, front view. 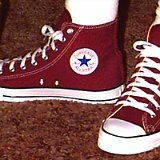 41 Maroon High Top Chucks Wearing maroon high tops, side view. 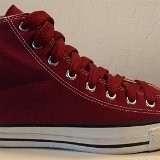 42 Maroon High Top Chucks Wearing new maroon high tops, outside view. 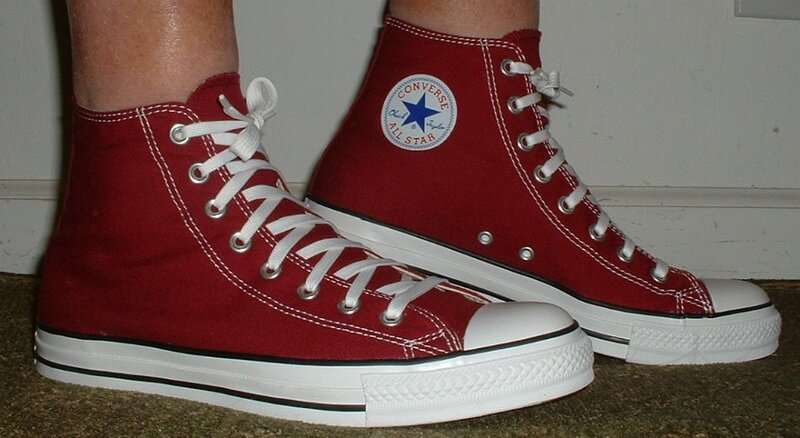 43 Maroon High Top Chucks Wearing maroon high tops, front view. 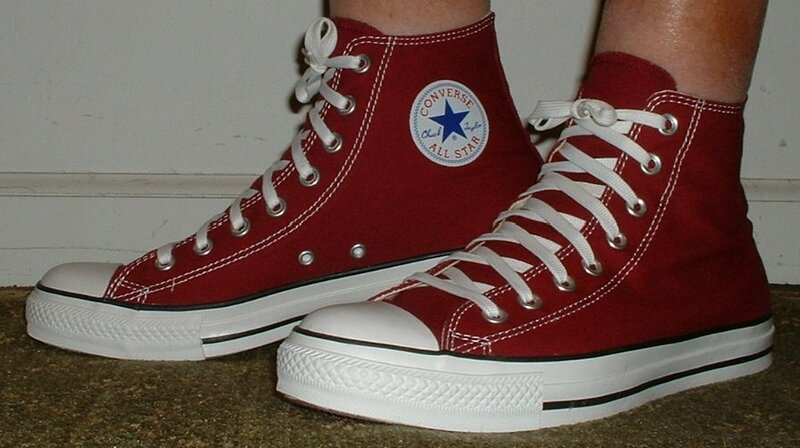 44 Maroon High Top Chucks Stepping out in maroon high tops, rear view. 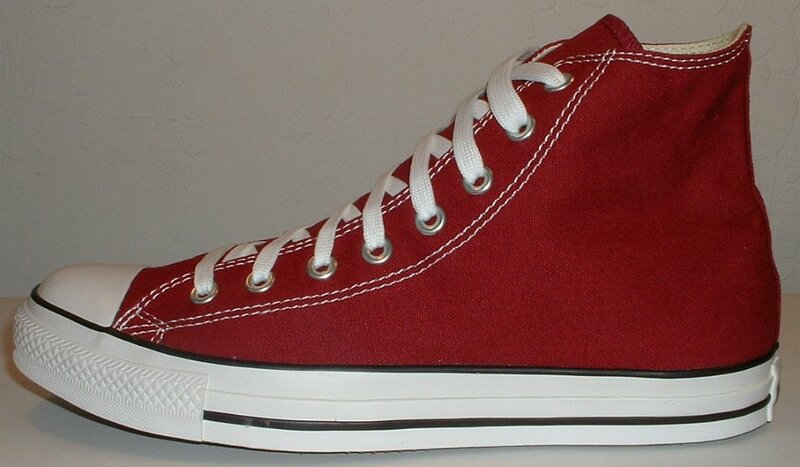 45 Maroon High Top Chucks Wearing new maroon high tops, angled front view. 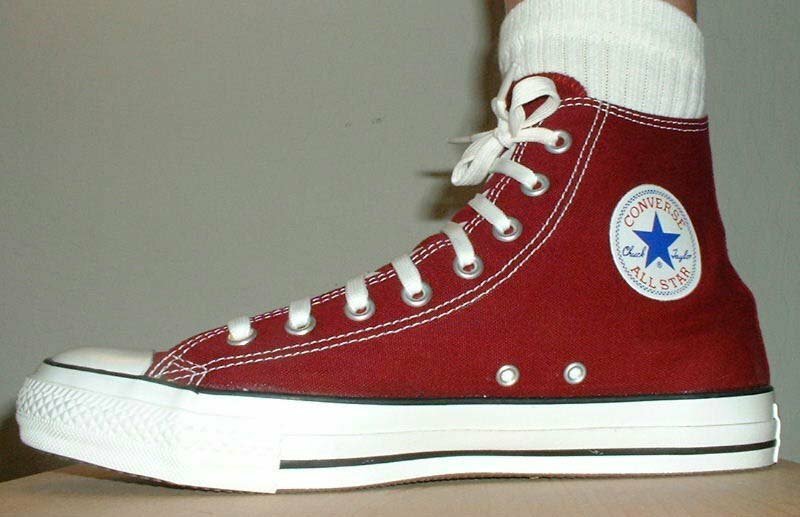 46 Maroon High Top Chucks Wearing maroon high tops, rear view. 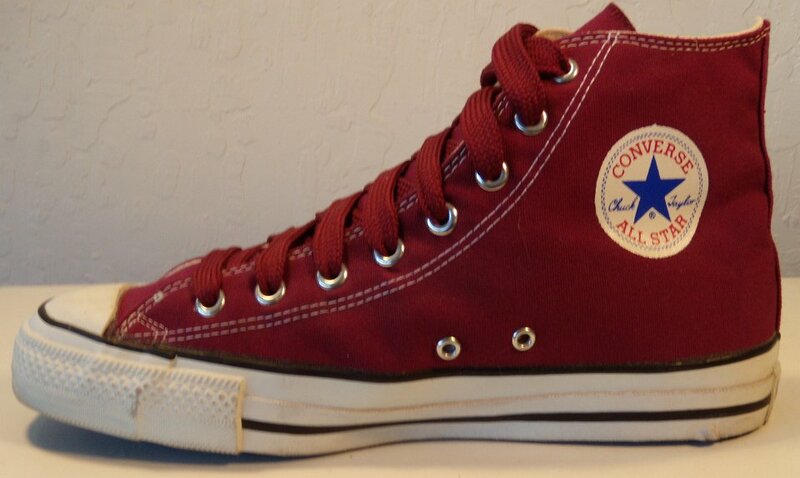 47 Maroon High Top Chucks Inside patch view of a right maroon high top. 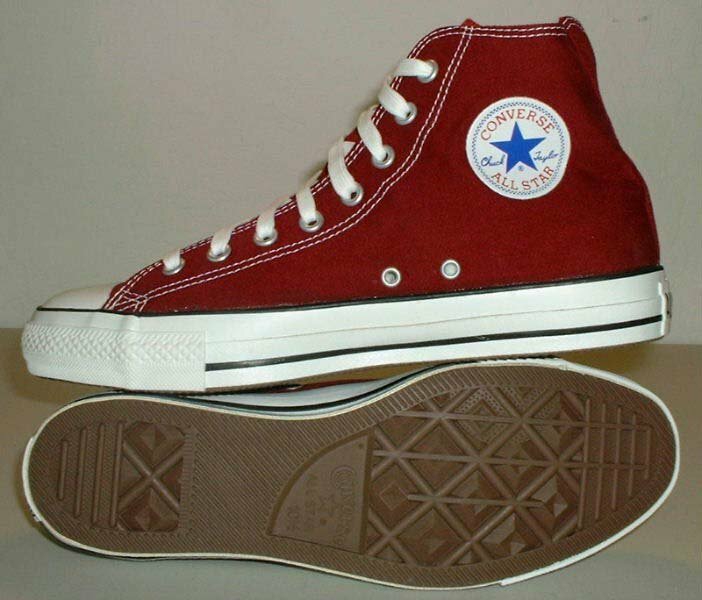 48 Maroon High Top Chucks Outside view of a right maroon high top. 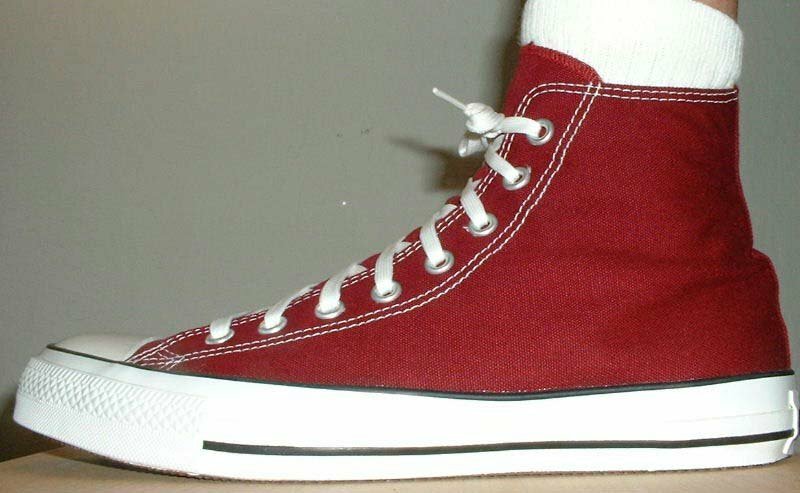 49 Maroon High Top Chucks Inside patch view of a left maroon high top. 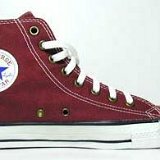 50 Maroon High Top Chucks Outside view of a left maroon high top. 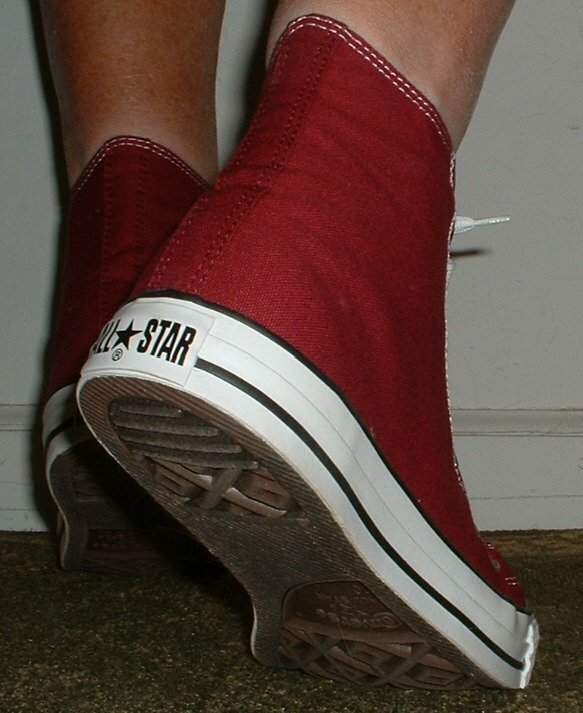 51 Maroon High Top Chucks Rear view of maroon high tops. 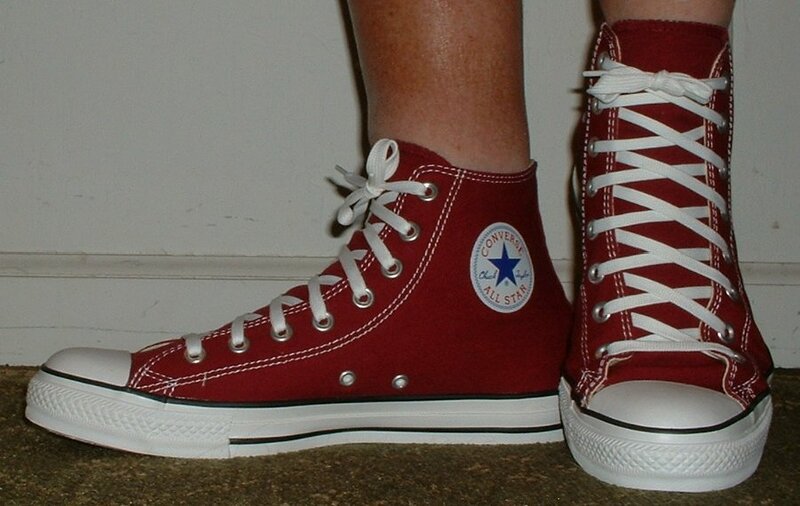 52 Maroon High Top Chucks Angled rear view of maroon high tops. 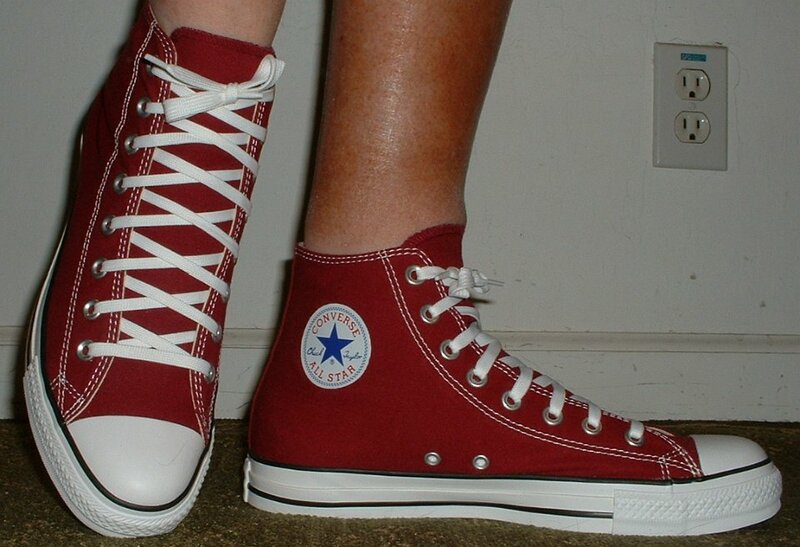 53 Maroon High Top Chucks Angled side view of maroon high tops. 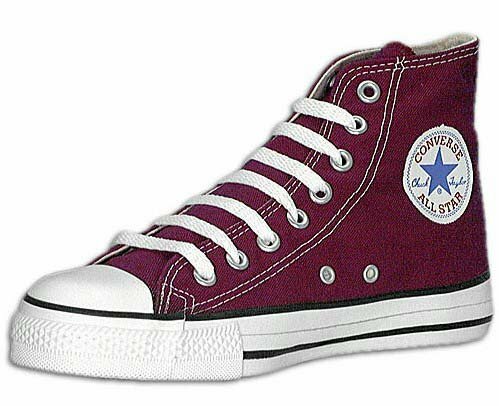 54 Maroon High Top Chucks Front view of maroon high tops. 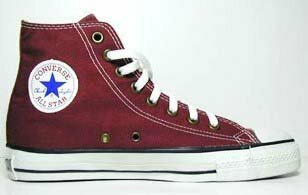 55 Maroon High Top Chucks Angled front view of maroon high tops. 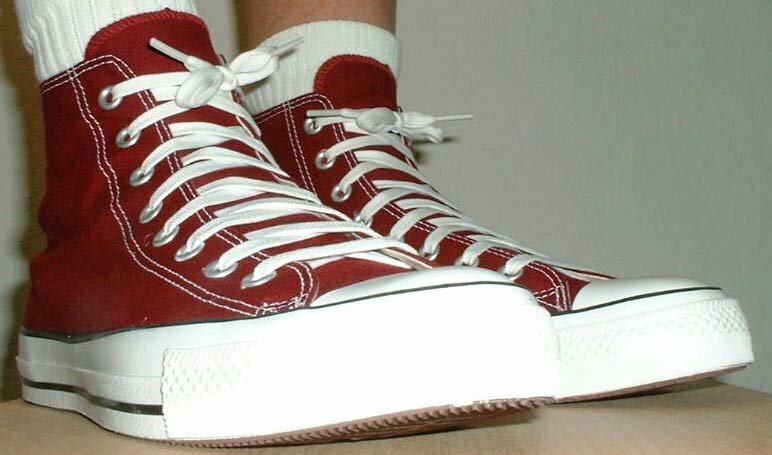 56 Maroon High Top Chucks Top view of maroon high tops. 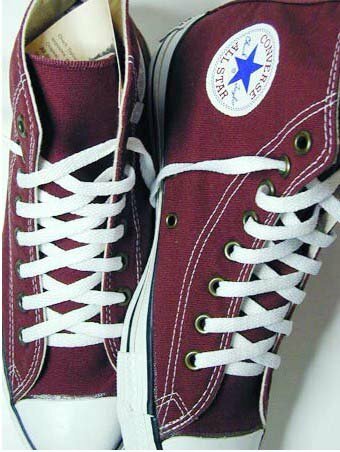 57 Maroon High Top Chucks Inside patch views of maroon high tops. 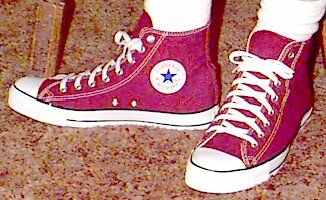 58 Maroon High Top Chucks Outside views of maroon high tops. 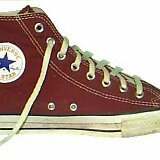 59 Maroon High Top Chucks Inside patch and sole views of maroon high tops. 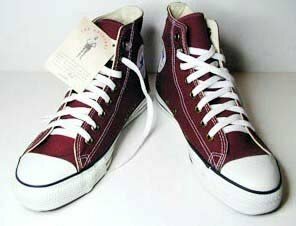 60 Maroon High Top Chucks Wearing maroon high tops, front view 1. 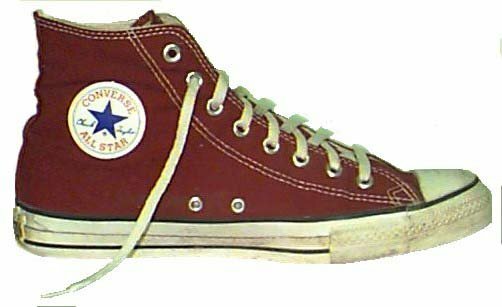 61 Maroon High Top Chucks Wearing maroon high tops, front view 2. 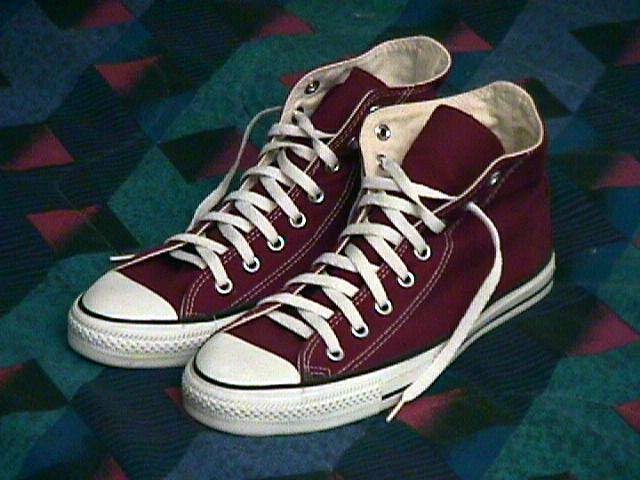 62 Maroon High Top Chucks Wearing maroon high tops, front view 3. 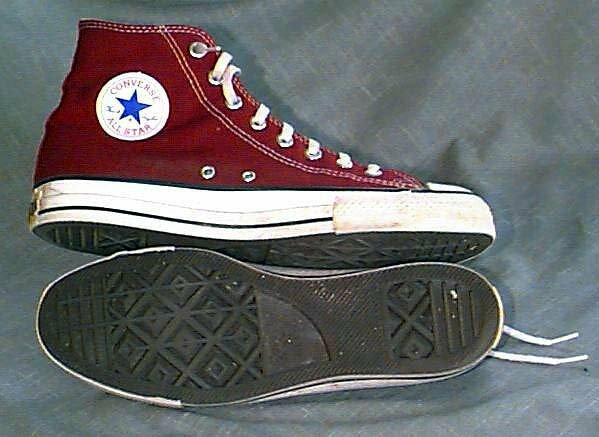 63 Maroon High Top Chucks Wearing maroon high tops, right side view 1. 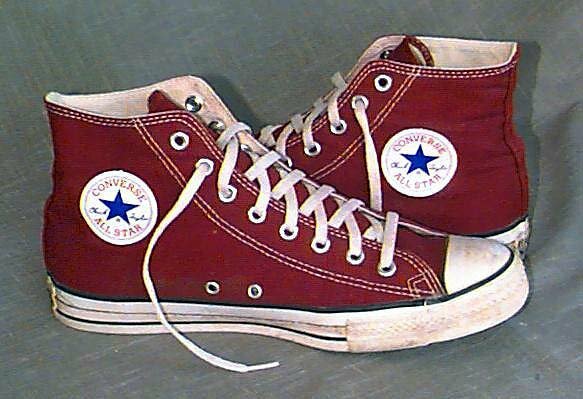 64 Maroon High Top Chucks Wearing maroon high tops, right side view 2. 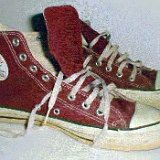 65 Maroon High Top Chucks Wearing maroon high tops, rear view 1. 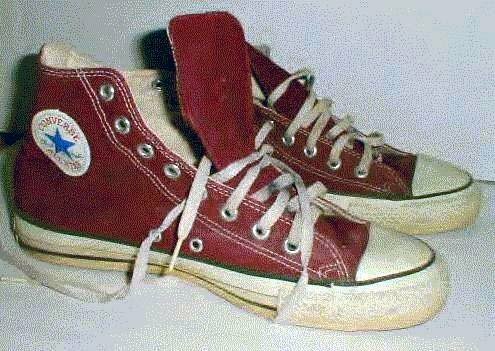 66 Maroon High Top Chucks Wearing maroon high tops, rear view 2. 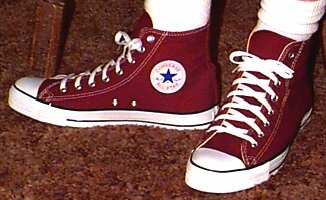 67 Maroon High Top Chucks Wearing maroon high tops, rear view 3. 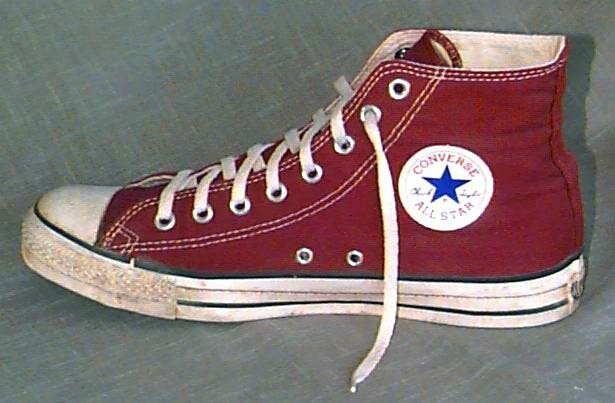 68 Maroon High Top Chucks Wearing maroon high tops, left side view 1. 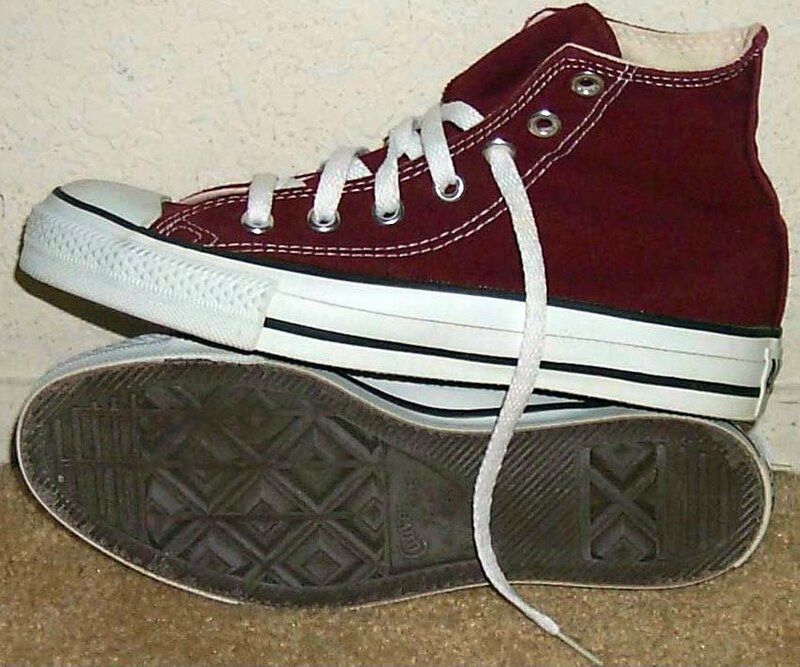 69 Maroon High Top Chucks Wearing maroon high tops, left side view 2. 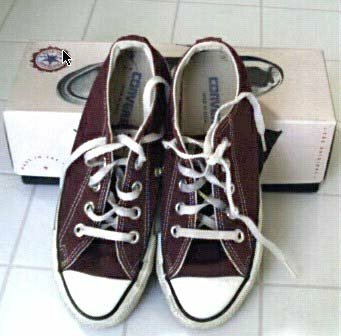 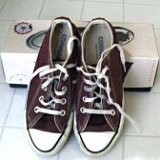 70 Maroon Low Cut Chucks Maroon low cut, top view with box. 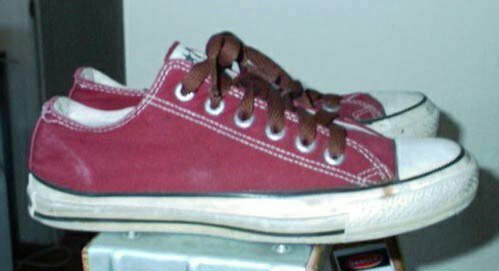 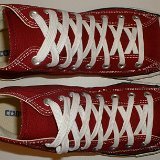 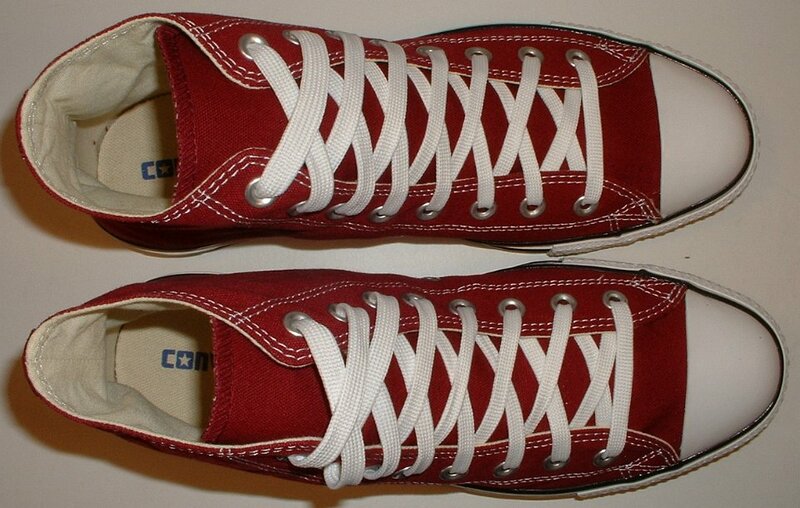 71 Maroon Low Cut Chucks Worn maroon low cuts with brown laces, side view. 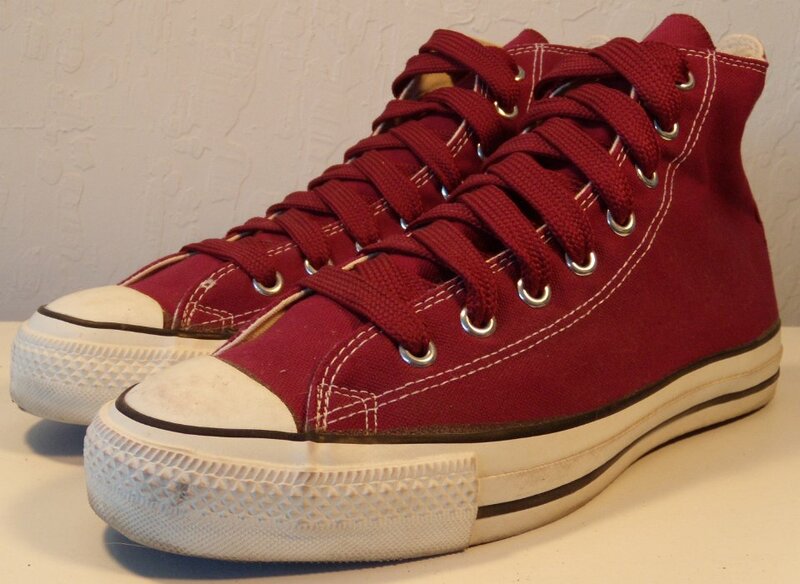 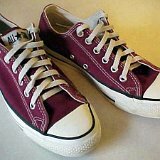 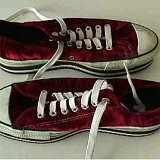 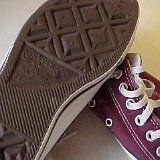 72 Maroon Low Cut Chucks Worn maroon low cuts. 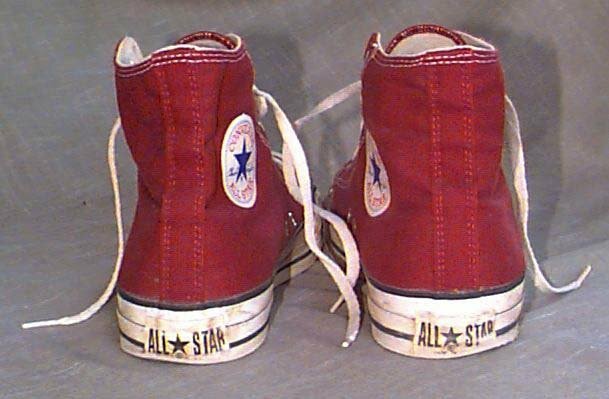 side and angled rear view. 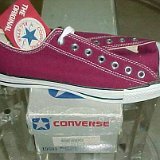 73 Maroon Low Cut Chucks New maroon low cuts with tag and box, side and top views. 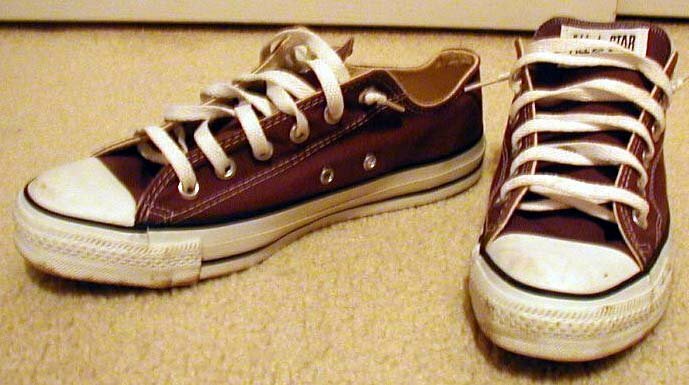 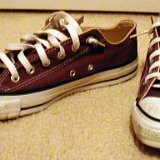 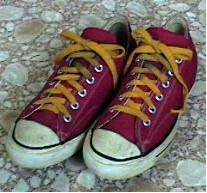 74 Maroon Low Cut Chucks Worn maroon low cuts, with gold laces, angled top view. 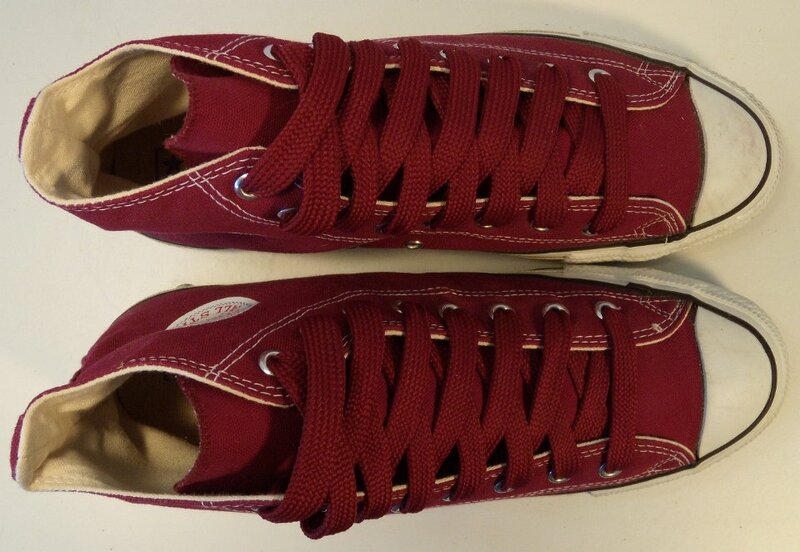 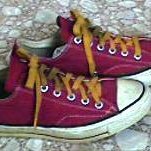 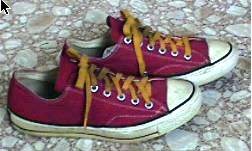 75 Maroon Low Cut Chucks Worn maroon low cuts with gold laces, side views. 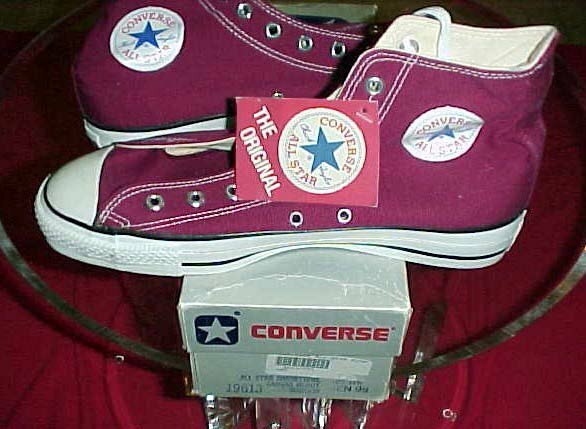 76 Maroon Low Cut Chucks Maroon low cuts, side view. 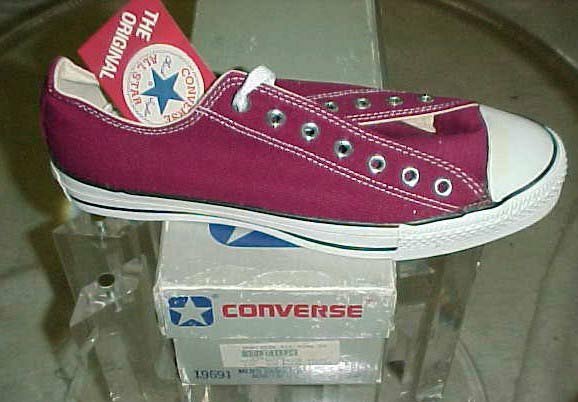 77 Maroon Low Cut Chucks Maroon low cuts, angled side view. 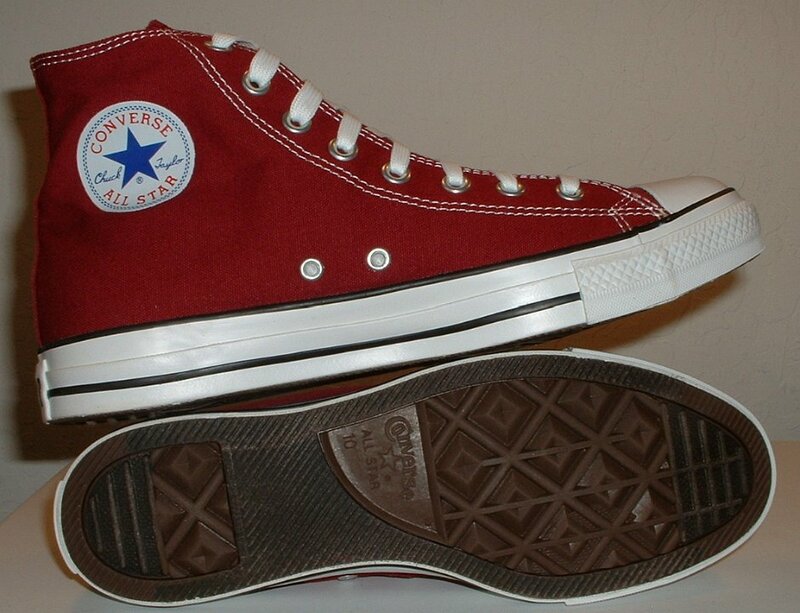 78 Maroon Low Cut Chucks Worn maoon low cuts, rear view. 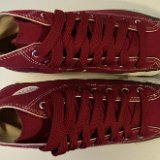 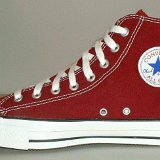 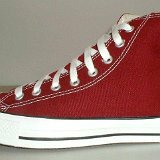 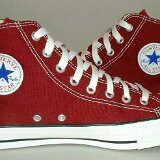 79 Maroon Low Cut Chucks Maroon low cuts, sole and top views. 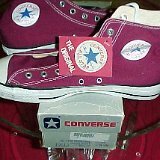 80 Maroon Low Cut Chucks New right maroon low cut with tag and box, side view. 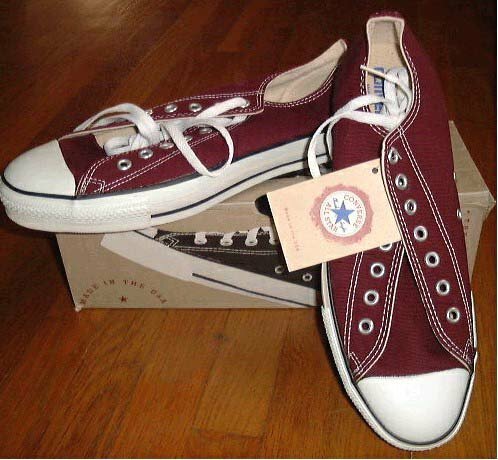 81 Maroon Low Cut Chucks Maroon low cuts, angled top view. 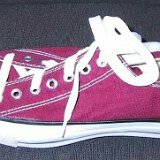 82 Maroon Low Cut Chucks Maroon platform low cuts, top view. 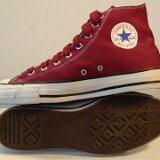 83 Maroon Low Cut Chucks Maroon platform low cuts, top and side views. 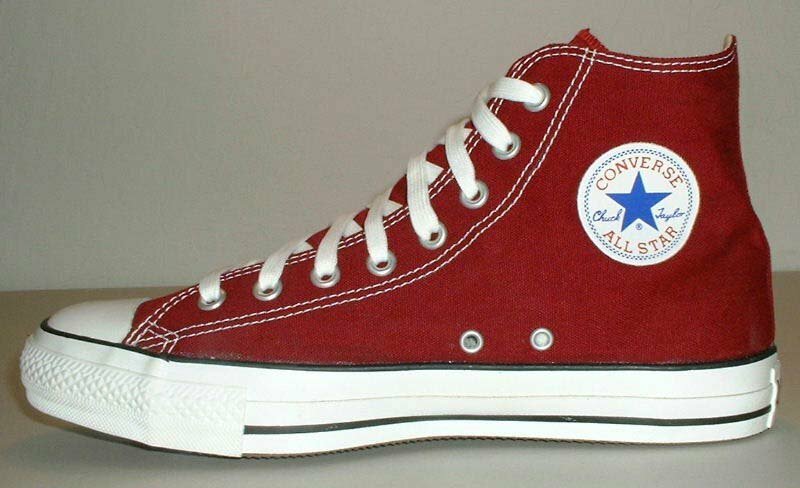 84 Maroon Low Cut Chucks New maroon low cut, side view. 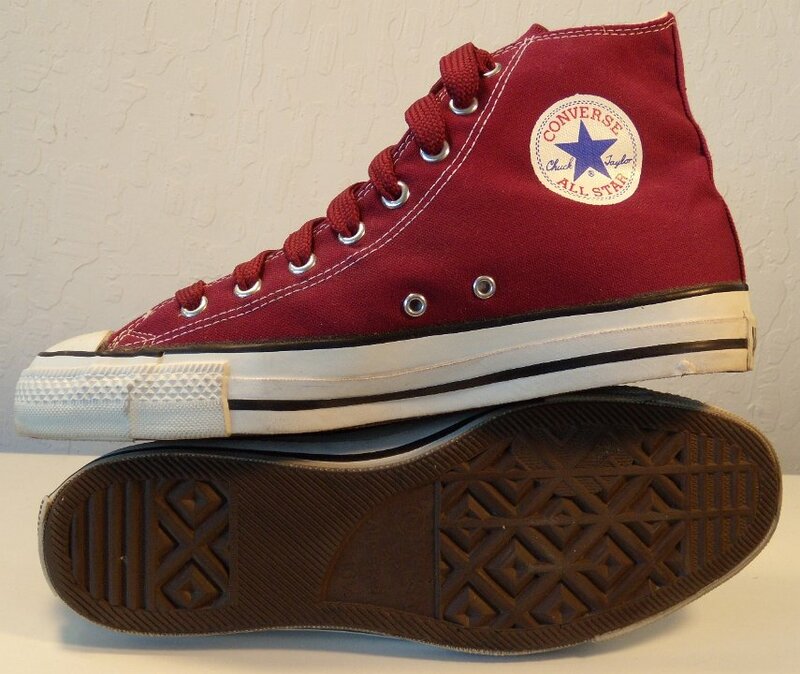 85 Maroon Low Cut Chucks Maroon low cut, angled front views. 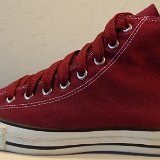 86 Maroon Low Cut Chucks Side view of maroon Dr. Pepper low cuts. 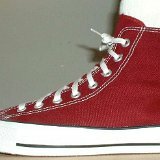 87 Maroon High Top Chucks Inside patch view of a right maroon made in USA high top with fat maroon shoelaces. 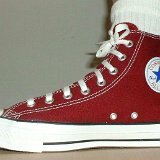 88 Maroon High Top Chucks Outside view of a right maroon made in USA high top with fat maroon shoelaces. 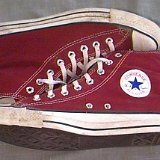 89 Maroon High Top Chucks Inside patch view of a left maroon made in USA high top with fat maroon shoelaces. 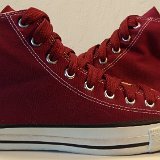 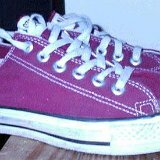 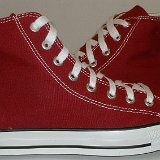 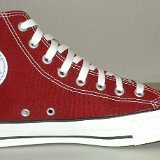 90 Maroon High Top Chucks Outside view of a left maroon made in USA high top with fat maroon shoelaces. 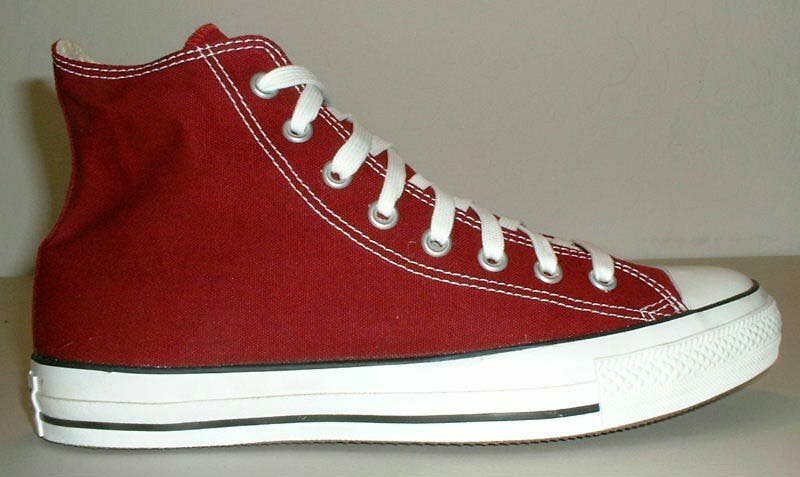 91 Maroon High Top Chucks Rear view of maroon made in USA high tops. 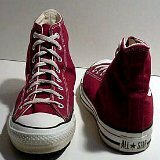 92 Maroon High Top Chucks Angled rear view of maroon made in USA high tops. 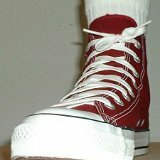 93 Maroon High Top Chucks Angled side view of maroon made in USA high tops with fat maroon shoelaces. 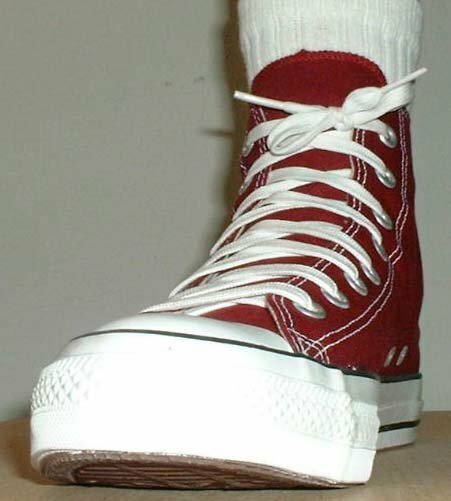 94 Maroon High Top Chucks Front view of maroon made in USA high tops with fat maroon shoelaces. 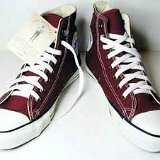 95 Maroon High Top Chucks Angled front view of maroon made in USA high tops with fat maroon shoelaces. 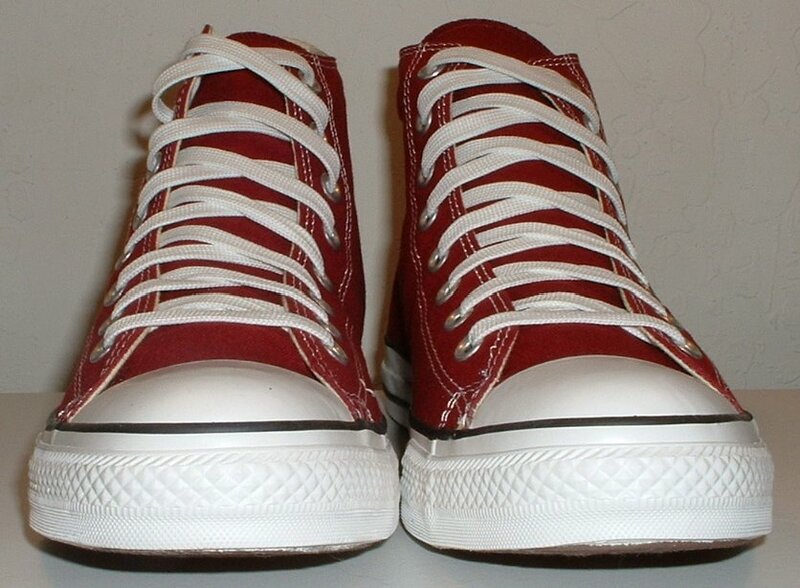 96 Maroon High Top Chucks Top view of maroon made in USA high tops with fat maroon shoelaces. 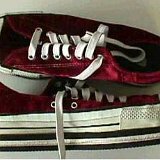 97 Maroon High Top Chucks Inside patch views of maroon made in USA high tops with fat maroon shoelaces. 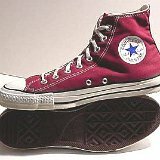 98 Maroon High Top Chucks Outside views of maroon made in USA high tops with fat maroon shoelaces. 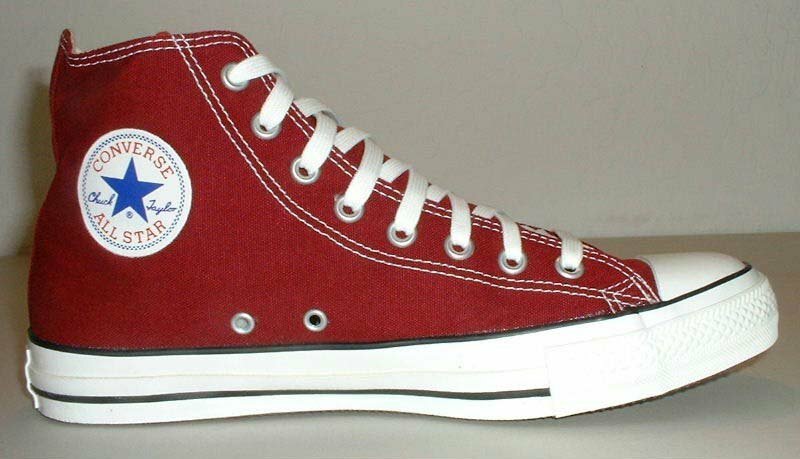 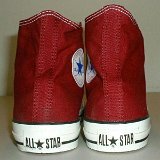 99 Maroon High Top Chucks Inside patch and sole views of maroon made in USA high tops with fat maroon shoelaces. 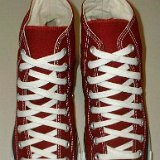 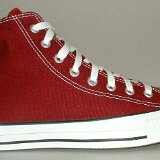 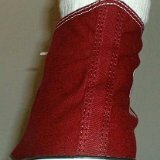 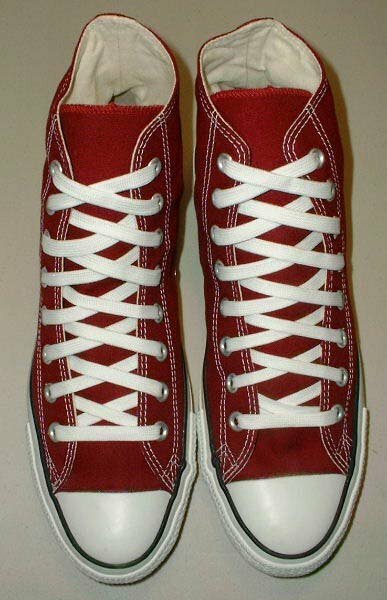 100 Maroon High Top Chucks Insole view of a maroon made in USA high top with fat maroon shoelaces. 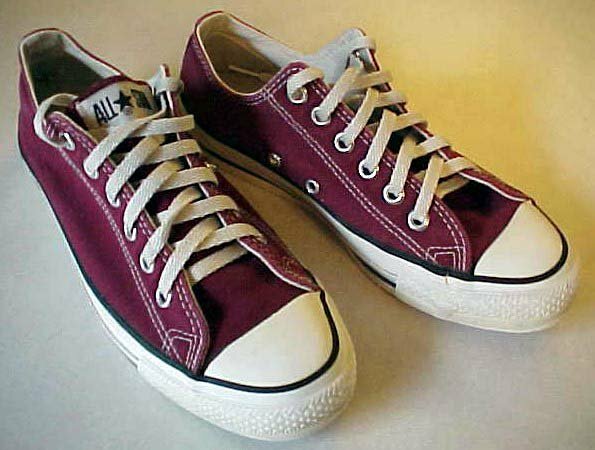 Maroon was once a core color, back in the 1980s and 1990s. 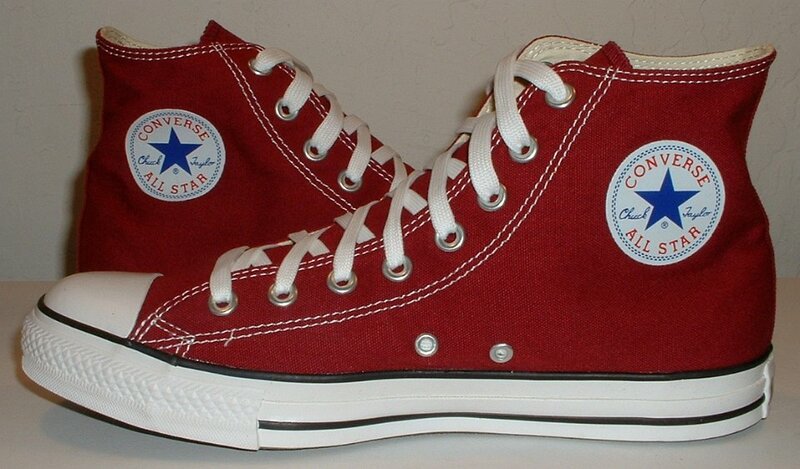 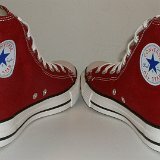 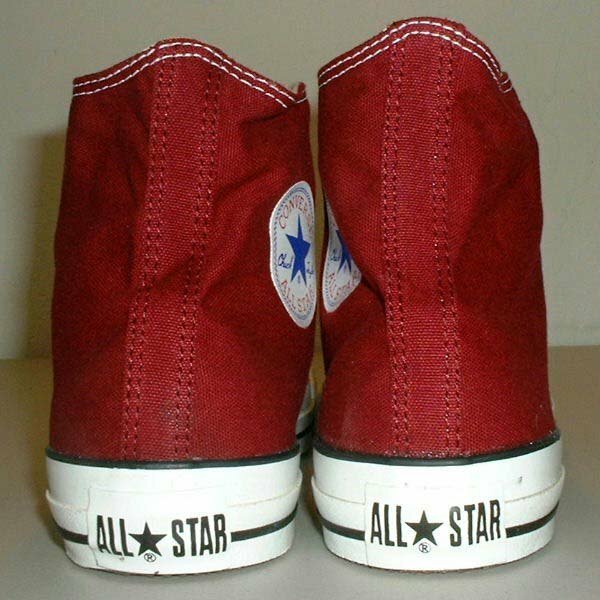 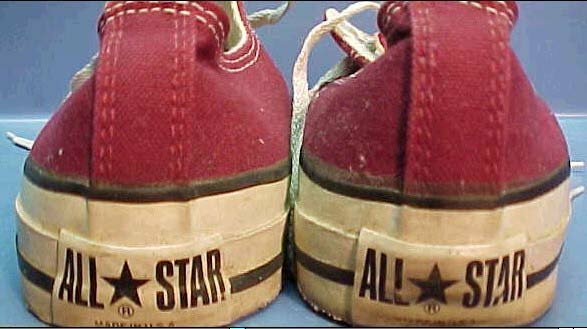 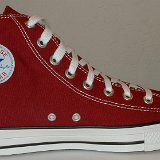 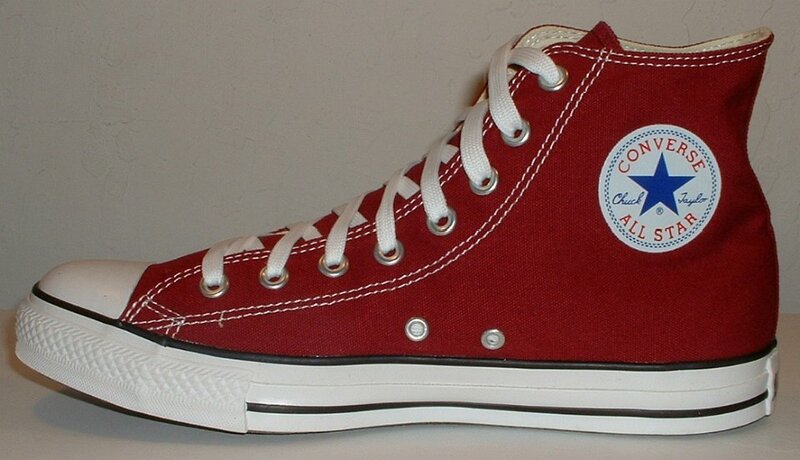 Now chucks are still produced in this color, but on a seasonal basis.